Before heading to the commissary or exchange at Langley Air Force Base near Hampton, Virginia, take a look at the coupons and other discount information on MyMilitarySavings.com. We’ve gathered together savings from a variety of sources into a one-stop source for savings that military shoppers can access from stations around the world. We are familiar with the challenges that members of the armed forces and their families often face, so we’ve made our mission to ensure that seeking out helpful discounts for shopping at the exchange and commissary isn’t a hardship. Additionally, we’ll send you a free e-newsletter each week with links to digital copies of the Coupon Connexion and Price Connexion. That way, you can see the in-store deals for the commissary and exchange before ever leaving home, allowing you to plan your shopping trip more easily. 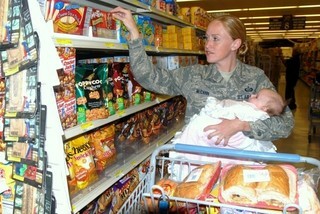 To find more savings information for the Langley AFB exchange and commissary, enroll for your free account at MyMilitarySavings.com.